"I came up with this after trying to figure out what to do with some leftover ham bits, and, so far, everyone loves it." Heat olive oil in a large pot over medium heat; cook and stir onion until translucent, 5 to 10 minutes. Add potatoes and ham to onion; cook and stir until ham is heated through, about 5 minutes. 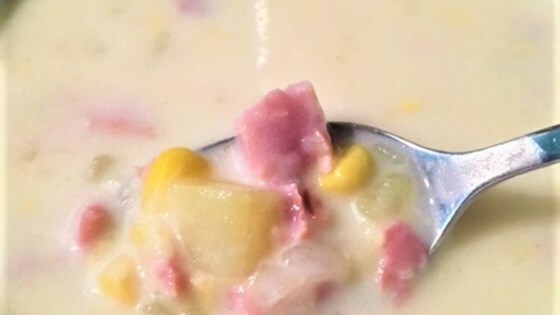 Mix whipping cream, creamed corn, frozen corn kernels, milk, water, chicken bouillon, garlic powder, onion powder, and ground ginger into onion-potato mixture; cook over medium-high heat until potatoes are softened, 30 to 45 minutes. Season soup with salt and pepper. Just like the restaurant but better cause I made it myself. Everyone had second helpings and with some saltine crackers, it was the perfect meal on a cold night with friends. I only changed the cream corn and used cream of potatoe...but love the taste great job.. Outstanding. Used fresh corn rather than frozen cause it's in season.